2011 was a very difficult year for GPA-Tallahassee in our efforts to help the dogs retiring from Jefferson County Kennel Club (JCKC). At the beginning of the year, we struggled to move the dogs left from 2010. We spent the whole year behind-the-eight-ball financially. Some of our most stalwart volunteers moved away or had life changes causing them to "bow out". We continued to get dogs in bad physical condition and eventually ran up a $5,000+ vet bill. In the Fall, we were blind-sided by an early seasonal closing of the track. We heard about it "through the grapevine" less than 2 weeks before it happened. No one from the track ever communicated with us. The track closed for nearly 4 months, instead of the usual 4-6 weeks. From Oct - Feb, we moved 125+ dogs at an average cost of $100 per dog (not including any vet expenses) with minimal financial assistance from the track. Throughout all this, the track and the kennels refused to give us firm numbers about how many dogs were actually available as pets, their names, ages, colors, etc. We just took the dogs as they brought them. The last few bunches of dogs included several requiring out-of-the-ordinary vet care, including one with flesh-eating bacteria acquired from having been bandaged after an injury and then just left to sit for 2+ months. Dogs appeared in our adoption kennel that had never raced at JCKC, but were brought to us by one of the JCKC kennel operators. The track then put a padlock on the adoption kennel. When I called the track to discuss the situation (especially finances), I was told they had somebody else who wanted to take over running the adoption program and would do it without the additional financial support we were requesting. I told them we could no longer be responsible for the adoption kennel (dog food, kennel help, etc. ), but would continue to work with them to move dogs. The track manager refused to tell me who would be running the adoption program. Last week, I called, offering to move a bunch of dogs to adoption (we would be hauling them ourselves) and was told there is no longer an adoption kennel nor anyone coordinating adoptions at JCKC. Each kennel is now responsible for disposing of their graded-off dogs. There is MUCH more to this story, but it's just too much to try to tell the whole story. I'll just say 2011 was HELL for us. Glen and I have other issues going on right now (personal/family issues) and we are not in a place to fight a battle over adoption at JCKC. We are dissolving GPA-Tallahassee, while still trying to figure out how to pay off the vet bill. Thanks to all who have helped us over the past 10+ years. We've moved thousands of JCKC dogs. It's heart-breaking to call a halt to our efforts. We'll be at GIG and look forward to seeing some of you there. For those of you that did not already know how bad it is at Jefferson County Kennel Club, aka JCKC, and JCKC owner Steve Andris, let me fill you in. My interaction with Steve Andris goes back almost 20 years. When visiting the Florida State Legislature I would stay at Diane Lithacum's house in Georgia and if we took a short detour we would pass JCKC. 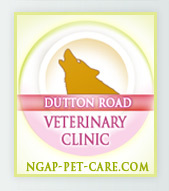 As it happens, just down the road from JCKC is a veterinary clinic with a 5 acre field and a backhoe. 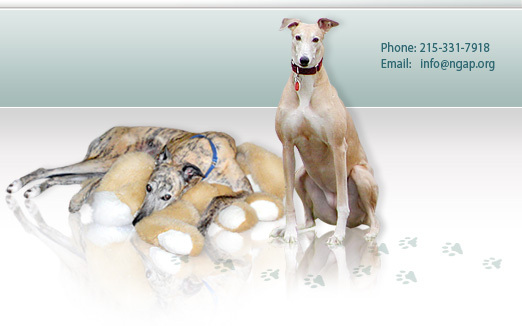 The veterinarian, one of two in the area, is known to do mass euthanasia of former racing greyhounds. He would then dig trenches and dump the bodies in. Keep in mind, this is a FIVE ACRE FIELD. When the field was completely filled with neat rows going in one direction, he would start digging new trenches perpendicular to those rows. As he would dig, the bones of the previously buried dogs would resurface. Above photos taken by David Wolf. 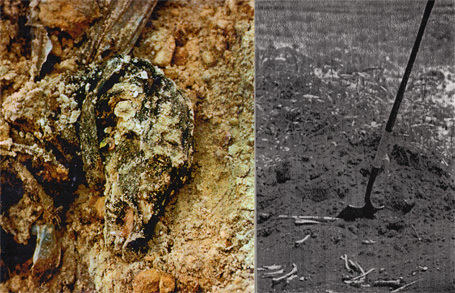 Left: Resurfaced greyhound skull. Right: Shovel next to resurfaced greyhound bones. 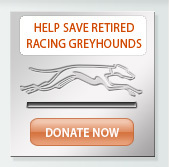 JCKC has always been a slaughterhouse for greyhounds. I think Pam Davis will probably agree that the dogs she was able to save were only the tip of the iceberg. She could only adopt those dogs brought to her. To the best of my knowledge, a kill truck still visits JCKC on a regular basis. When I would visit the track back in the day, I had a pari-mutuel license to pass through the gate. Approaching the kennel compound, even from a distance, the odor was so strong it could knock you down. The kennels then were old and crummy. The turnout areas were so small that a kennel staff person would have to be picking up poop as the dogs went or else another dog would step in it. The carpets in the cages for the dogs to lay on reeked. It was a dismal place. I can say the same thing for the track owner whom I met with way back then. He was a dismal person. While I was there, I can actually say that I feared for my safety. It was clear that he would not help the dogs. He cared little for them and usually kennel operators owed him money for food. He was always one-up. I suspect, as with the rest of the tracks in Florida, his clientele base has continued to diminish and relies heavily on high stakes card playing. JCKC should have been closed long ago. It has always been a terrible place and it will be until the day it disappears. I am sure that if the Pari-mutuel Division made daily inspections, they would find a way to close it down. But I am also sure the Pari-mutuel Division doesn't care to do that. In my view, they have never cared. So here we are in Florida with a a track owner that never cared, who runs an operation that is dismal, with a Pari-mutuel Division that doesn't care, in a state that doesn't care. And THAT is what I know about JCKC. You have to understand that Florida moves very slowly. In 1992, the Florida State Legislature had the choice of passing new regulations for the Pari-mutuel division (dog racing), reestablishing the existing regulations, or letting the regulations 'sunset', meaning there would be NO regulation. They chose to allow it to sunset, leaving no regulations whatsoever. I was there and was horrified. In 1993, we went to legislature with a laundry list of requests and what was passed was that 'all racing animals must be treated humanely throughout their lives during racing and after.' There was also a clause that prohibited euthanasia by any means other than lethal injection, that injection being sodium pentobarbital. In 1996, legislature was passed linking civil law and Pari-mutuel regulations. That law convicted David Gibby in Daytona, for a greyhound He's My Denny. Fortunately, I was there for that as well. Move ahead to 2004. Now well known nationally, then Senator Debbie Wasserman Schultz passed a rather shallow legislation. It's saving grace was that it required every track have an adoption program and stated that every track would have to support that program as well as host charity days to support that program. The Pari-mutuel division was required to oversee this regulation. Apparently, they failed. In 2010, the Pari-mutuel division presumably began the process of creating new animal welfare rules. I guess we are still waiting for that to happen! The Pari-mutuel division is well aware of the stench that comes from JCKC and all of the other things that are wrong at that track. Maybe they need to watch for the kill truck. It just so happens there is another law I helped to get passed in 1993 that prohibits greyhounds to be moved out of the State of Florida for the purpose of euthanasia. We know that was done before. Is it being done now? The greyhound community needs to come together and remind the Pari-mutuel division of their responsibility to assure that racing animals are treated humanely in the State of Florida throughout their lives, racing and after. If the greyhound community can speak loud enough, and if they continue to speak loud enough, we may again be able to prevail as we did with David Gibby in Daytona. Felony Animal Abuse. Guilty as charged. Go to jail. Information will be added within the next few days if anyone wishes to contact Florida officials regarding this matter.